At least for two days. 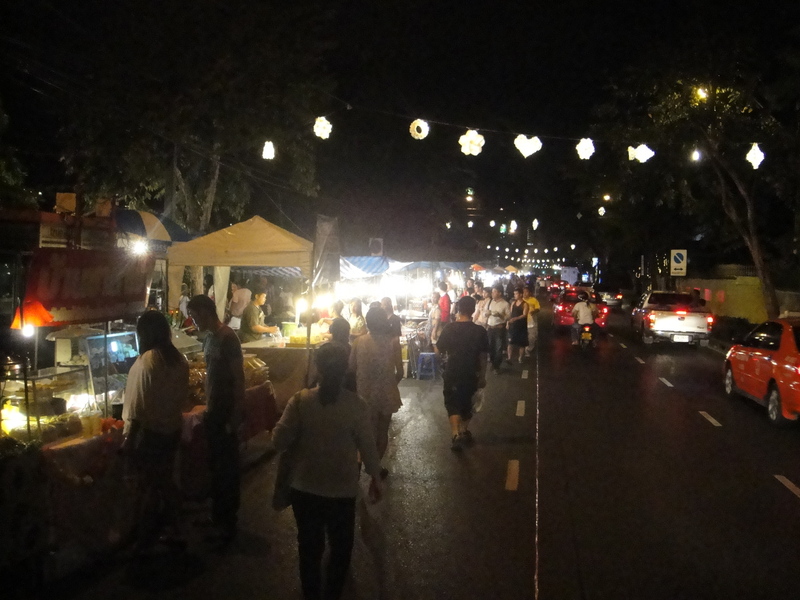 Soi Lang Suan has a Christmas market, two of the four lanes on the street are closed. While many of the goods on offer are the same that can be found in various markets around BKK, the food is very good. Loads of fried and grilled chicken, muscles, oysters, noodles and of course, beer. There are no container laws, so you can wander around drinking your Chang. To many Chang’s and the quality of goods for sale appears to increase, oddly this applies more to Thai people that farangs. Nice to see Bangkok putting on this kind of event. There is a stage setup for Christmas carolers, but it is more about just walking around, eating and trying to find a good deal (kids toys are the hot product and are being sold auction style). This should be done more at this time of year, the weather is cool enough you can actually walk the 8 blocks of the street fair without sweating. This entry was posted in Bangkok, Food & Restaurants, Thailand and tagged alcohol, Bangkok, Bangkok Christmas, current events, Farang. Bookmark the permalink.